The F-35A vs. F-35B: What Exactly is the Difference? The F-35 Stealth Fighter is a beast of a plane. Let's breakdown the differences between the various variants of the jet. Often times, the F-35 has been colloquially referred to as one aircraft in the media, or various versions of the F-35 have been conflated with each other. However, despite their shared “program,” the standard F-35A and the VSTOL F-35B are very different and even feature different fuselages in addition to the additional complexity introduced in the B variant. The primary difference between the two jets is that the B is less nimble in general. 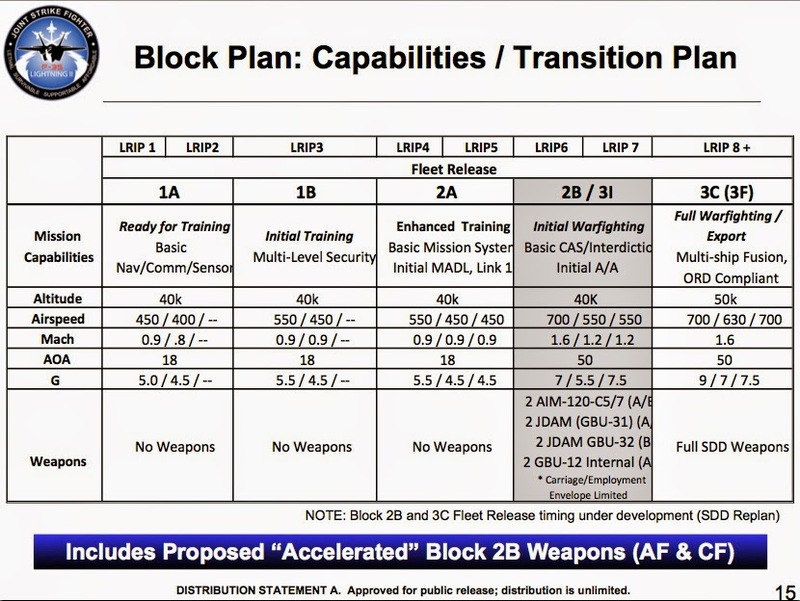 There are a multitude of reasons for this, many of which stem from the necessity for the B to have VSTOL capability. The B variant is considerably “fatter” and bulkier than the F-35A as a result of the integration of the lift fan. This image overlays the fuselage shape of the F-35A over the F-35B, with the B being in orange. As a result of the increased frontal profile, the B has more drag. This makes it slower to accelerate and harder to turn. Practically, the F-35B takes approximately eighteen more seconds to accelerate from Mach 0.8 to Mach 1.2 compared to the F-35A. The increased profile and different weight also affects the potential turn rate, but practically, the F-35B is limited to pulling 7Gs maximum to avoid damage to internal components. The B also has less internal fuel, but this is to be expected as it has additional parts that take up space in the fuselage that the A doesn’t. This limits its effective combat range versus the A, but it still is far superior to the other VSTOL aircraft that preceded it. Weapons wise, there are a few small but important differences between the F-35A and F-35B. The most obvious one is the omission of the gun at the wing root on the F-35B due to the different fuselage shape. Instead, the F-35B can mount a gun pod centerline under the fuselage with a stealthy fairing. This pod can carry an additional forty rounds versus the F-35A’s internal gun, and could potentially be more accurate as it’s directly center relative to the HUD and cockpit. 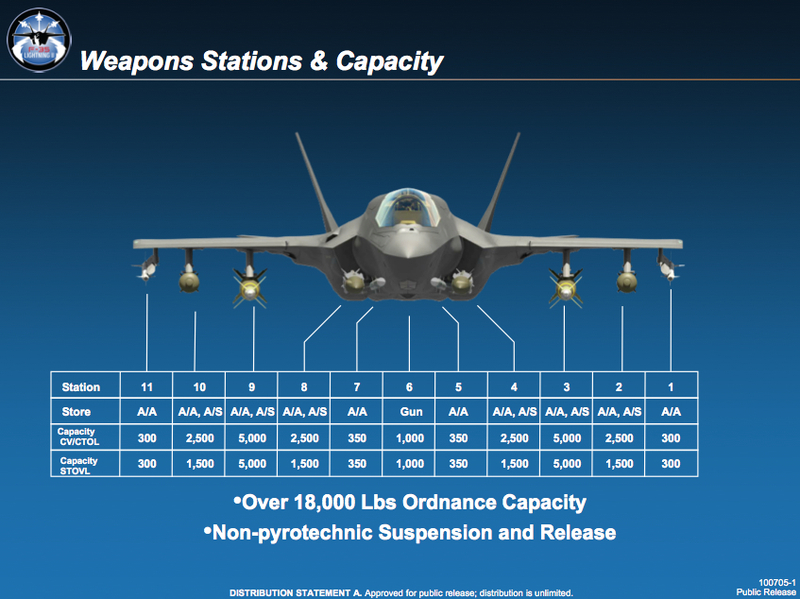 The weapons that the F-35B can carry internally are also different than the F-35A. Again, due to different requirements and fuselage shape, the internal weapon bays of the F-35B carry less weight than the F-35A. The biggest implication is that the F-35B cannot carry the massive two-thousand-pound bombs stealthily, in order to employ them they must be hung from the external weapon pylons. 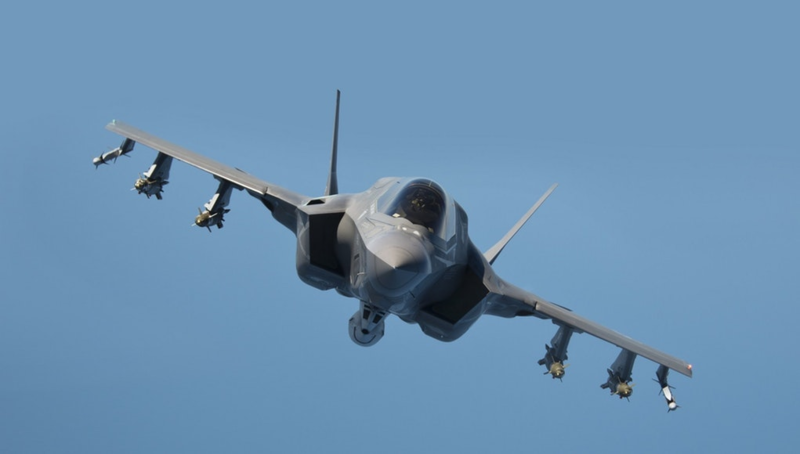 Most of the United States’ “bunker buster” bombs weigh that much, so the F-35B would not be able to perform a stealthy mission against a deep hardened target, whereas the F-35A would. The two and ten pylons on the wings also can carry less weight, so the F-35B has less overall munitions capability than the F-35A in that regard as well. However, it’s unlikely that the F-35B would want to operate at its max load in the first place given that it cannot vertically land with the maximum weight. If the F-35B took off with the maximum takeoff weight, it either would have to expend its stores in combat or jettison them before landing. All of these limitations may make it seem like the F-35B once in flight is by and large just a worse version of the F-35A. While this is true, it’s important to consider the roles of the aircraft. The F-35B is far closer in capability to the F-35A than the AV-8B was to the F-16C. The AV-8B couldn’t even go supersonic, it had significantly fewer hardpoints, and its radar, while decent was worse than the F-16C. The F-35B, by comparison, is pretty much the same aircraft as the A, with just some limitations on maneuverability and weapons. It features the same top-notch sensor systems, radar, and datalink capabilities that the A brings to the table.